The Republican Party has shown nothing but disdain for the real needs of actual women. You can’t say Republicans lack for chutzpah. The cynical right-wing message-men have come up with a new insult to our intelligence—and to millions of US women. As Buzzfeed reported Friday, Republicans are now spinning a series of scandals to try to prove the Democrats are the party with the real “War on Women.” That’s just silly, and they know it. Needless to say, some current and former Democratic pols haven’t exactly covered themselves in glory recently. 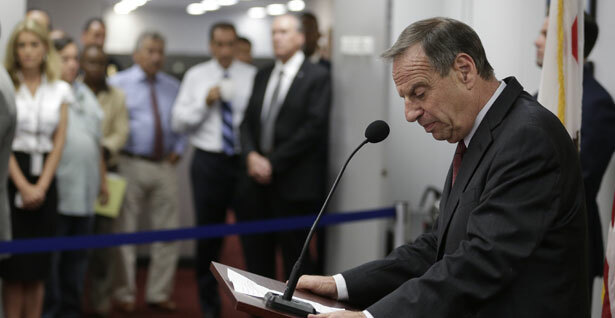 San Diego Mayor Bob Filner’s refusal to resign, despite an apparent pattern of repeated abuse, is particularly outrageous. But sexual indiscretion and sexual harassment (two types of scandal that shouldn’t be conflated) know no partisan affiliation. Remember Herman Cain, onetime GOP presidential frontrunner and accused serial sexual harasser? National Journal reported at the time that “scores of interviews with Iowa Republicans over the weekend turned up scant outrage” over the allegations. Some high-profile Republicans even questioned the concept of sexual harassment itself, with Representative Steve King calling it “a terrible concept,” and Senator Rand Paul warning that some now “hesitate to tell a joke to a woman in the workplace…” The horrors! Two months ago, Kristen Anderson, the former communications director for the Iowa Senate Republicans, announced she’d be filing a civil rights complaint after a firing she charged constituted retaliation for speaking up about a “sexually hostile work environment.” Anderson told The Des Moines Register she’d complained about men making comments about women’s bodies and sexual orientation, and that it cost her her job. Where’s the Republican outrage over that? Don’t hold your breath.